This week Friday cooking, my Mexican friend is working on desserts. He told me that he was making cheesecake, I wasn't very convinced that it was a cheesecake. In general, cheesecake has to be done a day in advance. I asked him the name in Mexican - Pay de Queso and google what is the correct terminology. Surprisingly, it is known as Mexican cheesecake. The ingredient used is a bit weird, but it ended up to be very delicious. 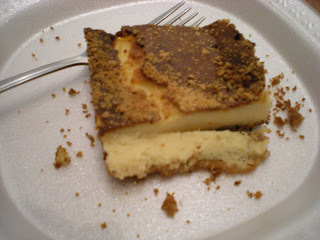 The cheesecake was slightly burnt due to overbaking, there shouldn't be any brown crust formation as can be seen in the picture. 2. In a plastic bag, crush cookies with a rolling pin until it reaches crumb size. 3. In a saucepan, melt butter over low heat and stir in the cookie crumbs. 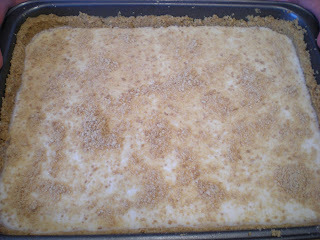 Transfer mix into a 11'' x 7'' baking pan by pressing firmly over bottom and up side of the baking pan. 4. In a blender, combine cream cheese, eggs, condensed and evaporated milk. 5. Bake for 30-40 mins. Use a toothpick to check for doneness. Let it cool for 10-15 mins. Serve. We haven't made this in two years, we used one full package, about 30 cookies. 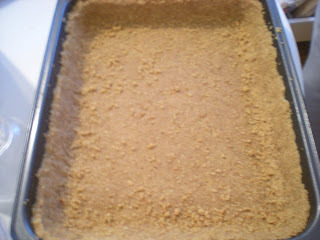 Just enough butter to hold all the cookie crumbs together, and enough crumbs to cover the whole baking pan.